ALAN* SPENT OVER three years living on the streets of Dublin. He had worked in construction in the past, but when the recession hit Ireland near the end of the last decade, Alan found himself out of work. He started drinking and after a while he got himself into drugs. From there, he eventually found himself homeless. “Life on the streets was tough,” said Alan. “You had your whole life in a little bag and nothing to do and nowhere to go all day. Alan said the worst times he experienced while homeless was when people spat on him when he slept in a doorway. “You wouldn’t treat a dog like that,” he said. I can’t understand how you could treat another person with no respect at all. Other times, he said it was the kind way people treated him that kept him going at his lowest points. “I remember one Christmas Eve this woman started talking to me, asking me how I was,” he said. I don’t want to seem soft but I felt like crying. It was a great lift to see someone cared and took the time to treat me like a person. Alan’s story is highlighted in the 2015 annual report for homeless charity Focus Ireland, which was launched today. 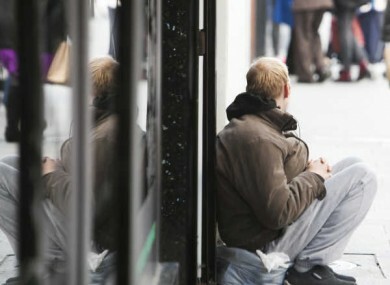 Focus Ireland provides supports and services for homeless people around Ireland. It works closely with the Dublin Regional Homeless Executive (DRHE) and other charities to provide accommodation, outreach, and many other services for homeless people. The charity reported a 9% rise in the number of people its services helped last year. It supported over 12,500 who were homeless or at risk in 2015 (up from 11,500 in 2014). Focus Ireland’s report points out that 2015 was the worst year ever for family homelessness in Ireland. The number of families becoming homeless rose from an average of 34 per month in 2014 to an average of 62 per month in 2015. As well as this, the total number of families living in emergency accommodation rose from 407 in December 2014 to 775 at the end of last year. The report also points out that one out of every three homeless people last year was a child. Speaking at the launch of the report, chairperson of Focus Ireland Gerry Danaher announced that the charity would be providing 600 new homes by 2019 to help tackle the growing issue of homelessness. Focus said it hopes to provide 150 homes over the next four years in order to double its current housing stock. “We all know that affordable housing supply is at the heart of the homeless crisis that blights the lives of so many,” said Danaher. Danaher mentioned the Housing Action Plan which was announced last month by government, saying that there was little in it to cut the number of families losing their homes. “Focus Ireland and the Dublin Regional Homeless Executive are supporting more families out of homelessness than ever before,” said Dannaher. But we cannot keep pace with the deepening crisis as 90 families have become homeless every month so far this year, compared with 60 a month last year. Latest figures show that 599 families and 1,202 children have become homeless in the first seven months of the year. There were 2,020 children within 993 families in emergency accommodation in the capital last month. Also speaking at the launch today, Sister Stanislaus Kennedy, who founded Focus in 1985, called on the government to properly address the growing issue of family and child homelessness. “It must be clear to everyone that the risks we are dealing with now are completely different because hundreds of children are involved,” said Sr Stan. She said that a national directive should be issued to prevent any family being left without an offer of emergency accommodation or put at risk of having to sleeping rough. “If this situation is not addressed immediately I fear we will see families with children being forced to spend a night on our streets,” she said. Alan, whose story was highlighted in the annual report, said that the Focus Ireland Coffee Shop in Temple Bar had given him the help he needed to get off the streets. ‘They really listened to me and helped get me somewhere safe to stay and then after another while I got into a Focus Ireland housing programme,” he said. Form there, Alan eventually got his own house through the charity, a monebt he described as the best in his life. “It is great to be able to turn the key and walk into your own place,” said Alan. “I have to pinch myself sometimes when I see where I am and how much better my life is now. A lot of people see someone sleeping rough on the street and think they are lost causes, but I think my story shows that nobody is a lost cause and that when you have the right support you can turn your life around. Read: Will the government really be able to stop using hotels to house the homeless by next year? Email “"You had your whole life in a little bag and nothing to do and nowhere to go all day"”. Feedback on “"You had your whole life in a little bag and nothing to do and nowhere to go all day"”.